With warm evenings waning and darkness falling before dinner prep revs up, this may very well be the last fowl I'll have grilled outdoors this year. But she grilled up fine. Nice and fine. And like Xixo in The Gods Must Be Crazy, I thanked her for offering her life for my dinner. I don't live near a poultry farm where I can attest my chicken gobbled organic feed and roamed free to peck organic grubs. (Why do radio talk shows book guests who advocate having a chat with the farmer who raised the chicken or eggs you're about to buy? To make sure they're fresh and wholesome? Where do these people live?) Mostly, I have at my disposal the local Perdue-stocked supermarket. Recently, they've begun selling a few Bell & Evans birds, which, although they're not "free-range" or organic, are a step up from Perdue who refuse to divulge their "proprietary poultry feed". Personally, I'm a little put off by the thought of my chicken being fed chicken parts. Oh, for a little farmer-chat. They're only selling these chickens whole right now. And I grill them in parts, which made me a fast study in the art of cutting up a chicken. GourmetSleuth.com helped a lot. I'm still getting the wingcut down, but the product of a home-cut is so superior (matched parts, attached skin) and cost-efficient that I may do this all the time. Note: I use an indirect cooking method on my gas grill. This involves turning off any burners directly under the chicken, and setting to low the remaining outboard burners. Direct heat is not recommended since it singes the exterior before the inside thoroughly cooks. 2 Rinse chicken with cold water and pat dry. Cut into at least 5 pieces: 2 wings, 2 leg-thighs, 1 breast. Note: GourmetSleuth.com instructs how to separate the leg from the thigh and the whole breast into 2 sides, giving 8 parts to grill, instead of 5. (I toss the back away.) The only recommendation I'd make is to keep the breast in one piece - it will hold moisture and be flavored by the breastbone. To the right are my 5 pieces, oiled and rubbed. Click for larger. 3 Mince or press garlic into oil. 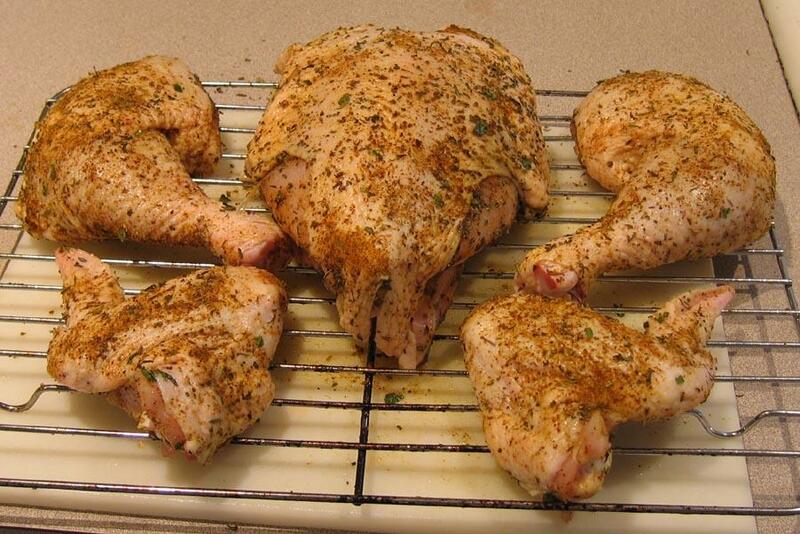 Rub chicken parts with garlic oil. 4 Combine spices in a small bowl. 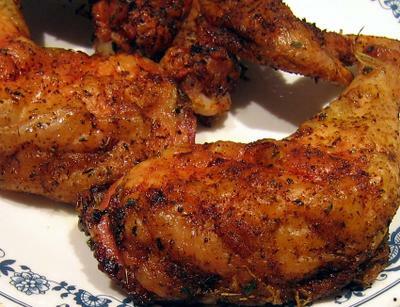 Rub spice mixture onto oiled chicken parts. 5 Grill all pieces for 30 minutes, then turn. Grill for another 30 minutes, then remove the breast (1 hour total). Grill remaining parts for another 30 minutes (1.5 hours total). As pieces are done, move to a serving plate and cover with aluminum foil to keep warm. You may want to place in a very low oven (no more than 100ºF) until ready to serve. My grill has a thermostat. So I can tell you that these times are based on a temperature no higher than about 310ºF. Note: The breast will continue to cook after its removed from the grill. It's important to keep it covered and away from drafts for at least 30 minutes - the time it takes for the darker meat to finish.